The Free and Hanseatic City of Hamburg is the second largest city in the Federal Republic of Germany (after Berlin). 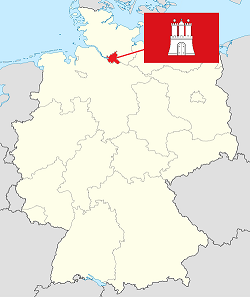 It is at the same time city and also one of the German ‘Bundesländer’ (states of the German Federation). HH on Hamburg’s car number plates stands for Hansestadt Hamburg. Hanse is a very old union dating as far back as the 13th century, which included almost all the German North and Baltic Sea ports such as Lübeck, Rostock, Stralsund, Danzig,... The purpose of this alliance was to help maintain free trade through their harbours. Today Hanse itself doesn’t have that much of an economical importance - it is more a traditional thing. The city stretches over an area of 755.3 square kilometres and has a span of approximately 40 kilometres in both NS and WE directions. Some 1.7 million people live in it. The city has a long tradition of trade and now boasts one of Europe’s largest and most important ports. For some years now it has been second only to Rotterdam. The port is the main part of Hamburg’s economical life. Through the river Elbe Hamburg can serve as the gateway to the world for cities and countries without direct access to the sea (e.g. Prague). Thanks to its port Hamburg is an important trade centre with one of the biggest wholesale markets in Europe. In the last decades the city has also turned into a media capital of Germany. It has a growing education sector: five universities and two ‘Fachhochschulen’ (universities of applied sciences) with about sixty thousand students. There is also an international airport which has been steadily reconstructed and improved in the last few years. Four major motorways connect Hamburg with the rest of Germany: the A1 towards Cologne and Lübeck, the A7 towards Frankfurt and Flensburg, the A23 towards the North Sea and A24 to Berlin. One of the greatest boosts for the development of this city was the discovery of the new world. Hamburg - up that point always in the shadow of the Baltic port of Lübeck - turned into the centre of North Germany and into one of the fastest growing European ports thanks to its better access to the Atlantic Ocean. Already by the end of the 16th century Hamburg had more than 40 000 inhabitants which made it the largest German city. The Greater Hamburg Bill, passed in 1937, was the only communal decision of the city’s Nazi government that was kept after the war. It created one big city with a population of almost two million people out of previously separate towns and communities. The original city of Hamburg was combined with the city of Altona, Harburg, the town of Wandsbek and some other formerly Prussian settlements, resulting in a metropolis: Hansestadt Hamburg. At that point the common development of Hamburg and Harburg began. Whether Harburg gained or lost with that unification is disputed (there are still people who would like to see Harburg as an independent city), but Hamburg as a whole definitely profited. Hamburg is about 1300 years old, having survived the plague, a great fire, bombings in the Second World War and a flood disaster.